It is time for the 10th Annual Ambulance Chace 5k and 1/2 Mile Fun Run! COME CHASE OUR SIREN SCREAMING AMBULANCE AROUND THE RACE COURSE! Bring the whole family out for the Ambulance Chase 5k and ½ mile fun run on May 26. The Fun Run will begin at 8:00 am with the 5k following at 8:30 am. 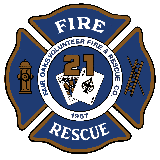 There will be fun for the whole family at the 10th Annual event supporting the Fair Oaks Volunteer Fire and Rescue Company. Your donations are greatly appreciated. All funds raised are used by FOVFR to support local communtiy fire and emergency medical services. The primary use of funds is the purchase of EMS and fire vehicles for the station. Special pricing for all Military, Fire & Rescue and Police of just $25!!! All runners registered before May 17 will be guaranteed a commemorative race T-shirt. Those who register after that date will receive shirts on a first come first serve basis. Packet pick up will be held at the =PR= Fairfax Corner on Friday, May 25 from 2:00-7:00 and on race day at the race site starting on 7:00 am. Awards will be given out to the top overall top 3 male and female finisher, as well as the top 3 male and female in the following age groups; 18 & U, 19-29, 30-39, 40-49, 50-59, 60 & Over. All Fun Run participants will recieve a ribbon.